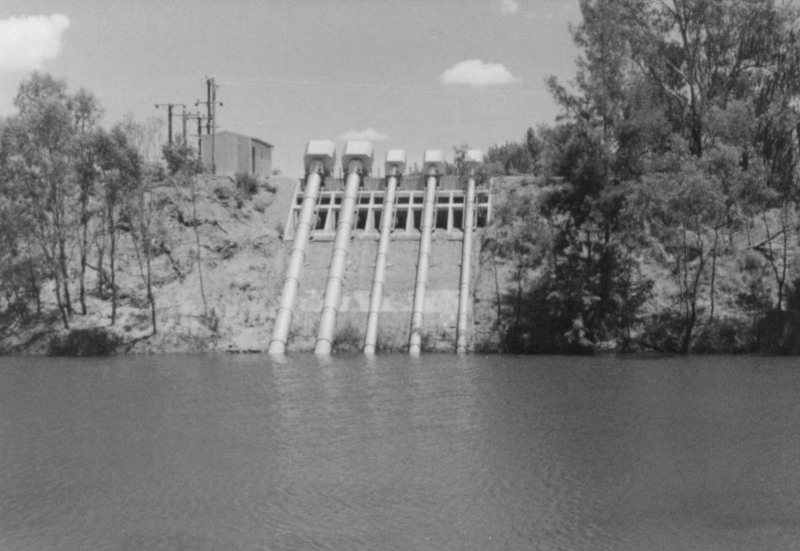 Irrigation pumps at ‘Buddah Lakes’ near Narromine in 1969. These pumps were among the first draw water from the Macquarie for cotton. Buddah was a prestigious grazing station that diversified into high capital intensive agriculture from the 1960s. The family patriarch is thought to have died from an illness caused by contact with pesticides. Source: Noel Butlin Archives Centre, Australian National University: McKillop and Sons Pty Ltd, Z376, CD ROM, ‘Buddah Lake pumps 1969’. Empty water storage cell near Bourke in 2007. When the Darling reaches a certain height irrigators pump from the river and carry water through channels to these cells. This one is 2.4 by 1.2 kilometres. The sky is brown with a dust storm. In the summer of 1991 the Darling River set a dubious record: the world’s longest toxic blue-green algae bloom. To Eric Rolls this ‘flaring green ribbon’ was a distress signal. Politicians, landholders, environmental managers and members of the public began using health metaphors to describe the state of the rivers. They were sick, they were dying, and they needed to be nursed back to health. The nineties, however, saw bitter conflict between upstream and downstream water communities, between irrigators and pastoralists. Reform was contested and occurred in the smallest of steps – the rivers suffered the ‘slow violence’ of grinding ecological change. The distinctive corduroy furrows of cotton fields.